Get to know Lisa Dalrymple – the new ConnectVA Program Associate for the Partnership for Nonprofit Excellence! My name is Lisa Dalrymple, and I am the new Program Associate for ConnectVA, a program of The Partnership for Nonprofit Excellence. I earned my Bachelor’s degree in Communications at Flagler College, in St. Augustine, Florida. I focused on nonprofit public relations, and have held related positions and volunteer roles since. Every skill learned and experience gained has prepared me for the role of a lifetime: connecting nonprofits, individuals, and the business community to opportunities to engage and collaborate. ConnectVA’s mission to power community ideas, information, and collaboration are values that really speak to me. In my first month with The Partnership, I have enjoyed working on a user guide and testing functionality for ConnectVA 2.0, a site redesign which launched this week (more about that below). Along with general maintenance and upkeep of ConnectVA, I assist with communications, such as the Weekly Update newsletter, blog posts, and social media. 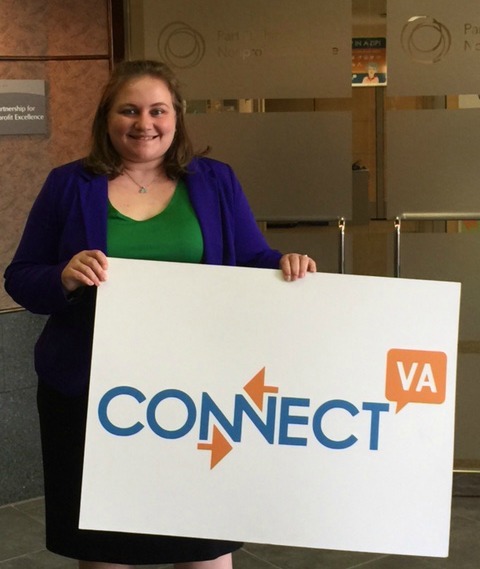 I’m excited to be part of an expanded team, and look forward to assisting the community with everything ConnectVA has to offer. Why are you passionate about serving the nonprofit sector in Central Virginia? Since moving to the greater Richmond area in 2010, I have been inspired by the work of the individuals I’ve met who are committed to giving back to their local communities. I feel a kinship with all of the volunteers, staff, and board members who work hard every day, sometimes with limited resources, to accomplish truly amazing things. I am thrilled to now have the opportunity to work for an organization that has an impact on a grand scale in the region. What do you find most interesting about the Partnership for Nonprofit Excellence? The Partnership for Nonprofit Excellence is comprised of four vital programs that help nonprofit organizations achieve their mission. I have enjoyed learning more about the role and scope of HandsOn Greater Richmond, Nonprofit Learning Point, and Organizational Solutions. Staff are truly passionate and committed to collaborating with each other to reach positive outcomes. I’m also excited to be a part of The Partnership’s marketing efforts, where our goal is to tell a compelling story about the unique mission of The Partnership as a whole. What’s coming next for ConnectVA that excites you? ConnectVA 2.0 is a more user-friendly, interactive, and mobile-optimized version of our resource hub. One of my favorite new features is the Member Directory. ConnectVA users have always been able to search and learn about the nonprofit and civic organizations listed in the Organization Directory, and now you’ll be able to search and connect with individual members as well. We’re truly making ConnectVA more collaborative!